Go to original pattern for design DROPS Extra 0-891. 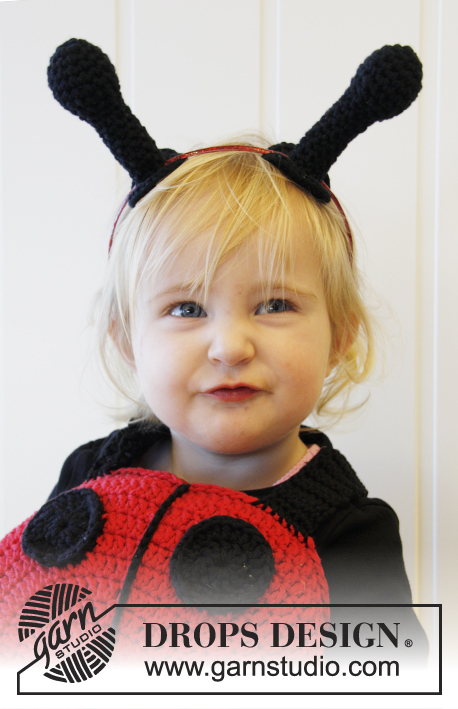 Crochet DROPS lady bug with shoulder straps in ”Paris”. Measurements: approx. diameter 24-28 cm / 9½"-11". 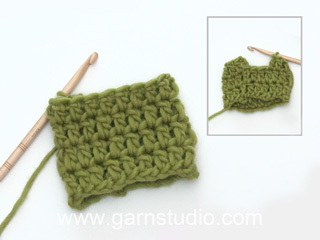 DROPS CROCHET HOOK size 5 mm / H/8 – or size needed to get 14 dc x 8 rows = 10 x 10 cm / 4'' x 4''. 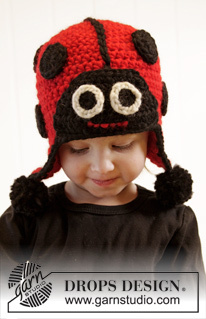 You can get the yarn to make this pattern from	7.20$. Read more. 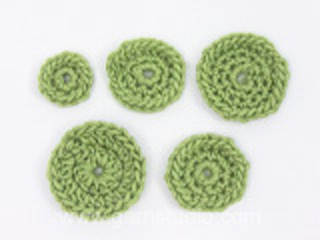 CROCHET TIP 1: Beg every round with 3 ch and these replace first dc. CROCHET TIP 2: Always replace first sc from beg of row with 1 ch. last pull through (= 2 sts on hook), then work next sc but on last pull through, pull yarn through all sts on hook = 1 st dec.
Work with black and hook size 5 mm / H/8. Ch 4 and form a ring with 1 sl st in first ch. Round 1: 12 dc in ch-ring, finish with 1 sl st in 3rd ch from beg of round. Round 2: 2 dc in every st, finish with 1 sl st in 3rd ch from beg of round = 24 sts. Round 3: 1 dc in every st - but in every other st work 2 dc, finish with 1 sl st in 3rd ch from beg of round = 36 sts. Round 4: 1 dc in every st - but in every 3rd st work 2 dc, finish with 1 sl st in 3rd ch from beg of round = 48 sts. same st. Continue like this until piece measures approx. 12-14 cm / 4 3/4"-5½" from the middle and out, then put piece aside. Work top side as underside but with red. 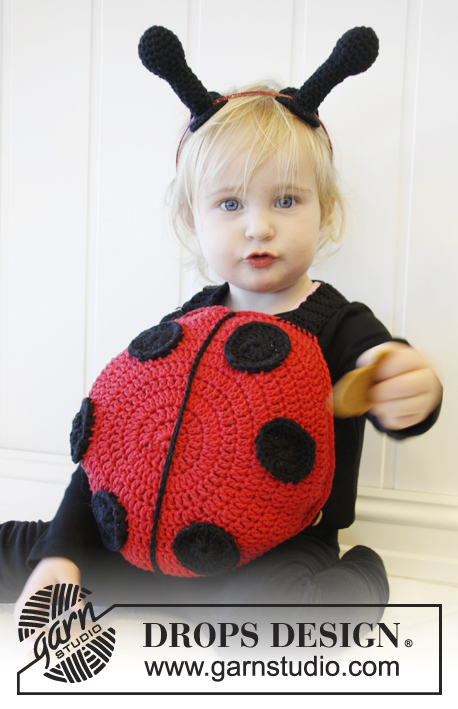 When piece measures 12-14 cm / 4 3/4"-5½" (same no of rounds as on underside), work another 2 rounds without inc. Now place the underside and top side on top of each other and work them tog with a sc round through both layers while at the same time filling the lady bug with poly stuffing. Ch 5 and form a ring with 1 sl st in first ch. Round 2: 2 dc in every st = 24 sts, finish with 1 sl st in 3rd ch from beg of round. Fasten off. Fasten the dots on the top side. Work a ch row of 24-28 cm / 9½"-11 with black. Fasten the row down along the middle of the top side. Ch 6 on hook size 5 mm / H/8 with black. 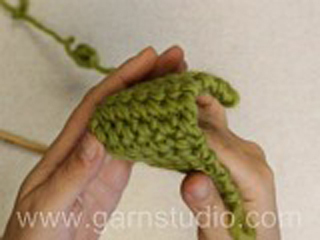 Work 1 sc in 2nd ch from hook, then work 1 sc in every ch = 5 sc - Read CROCHET TIP 2. Then work back and forth with 1 sc in every sc until piece measures approx. 35-40 cm / 13 3/4"-15 3/4" - AT THE SAME TIME when piece measures 25 cm / 9 3/4'' work a buttonhole by ch 1 instead of the middle sc and on next row work 1 sc in this ch. Repeat buttonhole every 4 cm / 1½'' a total of 2-3 times. 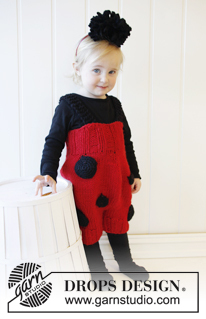 Fasten the shoulder straps to sc row at the top of lady bug approx. 8-10 cm / 3"-4" apart and fasten a button approx. 16-18 cm / 6 1/4"-7" from strap. Work 2 antennas with black on hook size 5 mm / H/8. Round 1: Work 6 sc in 2nd ch from hook, finish with 1 sl st in first sc on round. Round 2: ch 1, 1 sc in every st - but in every other st work 2 sc, finish with 1 sl st in first sc from beg of round = 9 sts. Round 3: ch 1, 1 sc in every st - but in every 3rd st work 2 sc, finish with 1 sl st in first ch from beg of round = 12 sts. Round 4: ch 1, 1 sc in every st - but in every 3rd st work 2 sc, finish with 1 sl st in first ch from beg of round = 16 sts. Round 5: ch 1, 1 sc in every st, finish with 1 sl st in first ch on round = 16 sts. Round 6: ch 1, 1 sc in every st - but work every 3rd and 4th st tog - read CROCHET TIP 3, finish with 1 sl st in first ch on round = 12 sts. Round 7: ch 1, 1 sc in every st - but work every 2nd and 3rd st tog, finish with 1 sl st in first ch on round = 8 sts. Round 8-16: ch 1, 1 sc in every st, finish with 1 sl st in first ch on round = 8 sts. Round 17: ch 1, 2 sc in every st, finish with 1 sl st in first ch on round = 16 sts. Round 18: ch 1, 2 sc in every st, finish with 1 sl st in first ch on round = 32 sts. Fasten off, fill the antenna with some poly stuffing and pull it on to a headband. Die Unterseite des Rückenteils wellt sich recht stark, wenn ich wie beschrieben zunehme. Bei der Oberseite kann ich das nachvollziehen, da diese ja eine Art Kuppel darstellt. Haben Sie die Maschenprobe eingehalten, auch in der Höhe? Wenn es sich zu stark wellt, probieren Sie, etwas weniger Zunahmen zu machen. An sich sollten beide Teile relativ flach werden. Die Oberseite bildet erst bei den letzten Runden eine Wölbung. 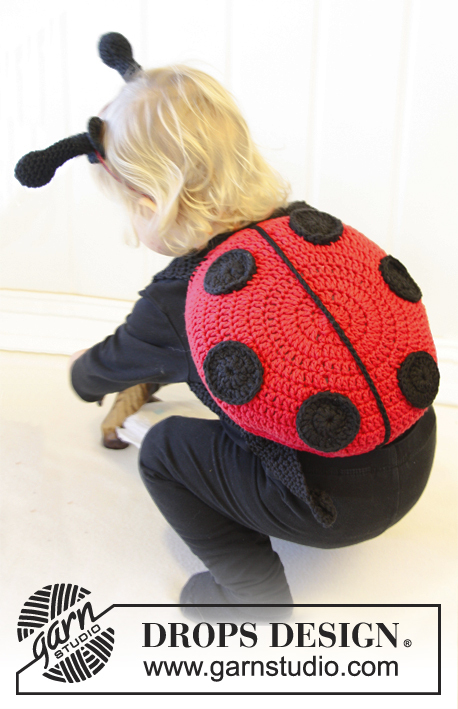 Bonjour, Je suis sur le modèle coccinelle je ne vois pas la fermeture du sac les explications pour le fermer merci. Bonjour Mme Margarian, le dos et le ventre de de la coccinelle se crochètent ensemble, sur l'endroit (placez les 2 pièces envers contre envers). Il n'y a pas d'ouverture prévue, mais vous pouvez en faire une pour la transformer en sac (avec un zip par ex.). Bon crochet! Leider stimmt bei diesem Modell die Mengenangabe für die schwarze Wolle nicht, für die Fühler musste ich 50g nachkaufen. Liebe Kathleen, damit der Kreis wächst, wird immer 1 Stb mehr zwischen den Aufnahmen gehäkelt. Hoi Femmy. Jawel. Onder de beschrijving van de BOVENKANT VAN LIEVEHEERSBEESTJE staat er: "Lug nu onderkant en bovenkant op elkaar en haak ze samen met een v toer door beide lagen en vul TEGELIJKERTIJD lieveheersbeestje met kussenvulling. Hecht af." Lurer på hva som menes me 4 omgang. Der det står. Hekle videre ved å hekle 1 stav mer mellom hver gang det hekles 2 staver i samme maske. Vil det si at jeg skal hekle 1-2-2 osv hele veien eller skal det være 3 staver i samme maske som det er 2 staver i.? ?